excitement as they anticipate that Her Royal Majesty, Queen Elizabeth, will make an appearance at today’s festivities. She is overjoyed to welcome back to the shores of Merry Ole England the most famous explorer of the time, Sir Francis Drake. He brings with him exotic traders from the East who shall display their wares alongside the local crafters. Entertainers from throughout Europe bring music and dance to the streets and stages during this day of color and splendor. Inside the gates of Willingtown, fine food, hearty drink, wondrous crafts and romantic revelry await those who come to play. This weekend was very very fun! It was my first time going out to a Renaissance Faire and I can say with certain I am looking forward to going again next year. I wasn't really prepared nor did I save up any nearly enough money but I was able to score this very awesome mug for only $20.00! 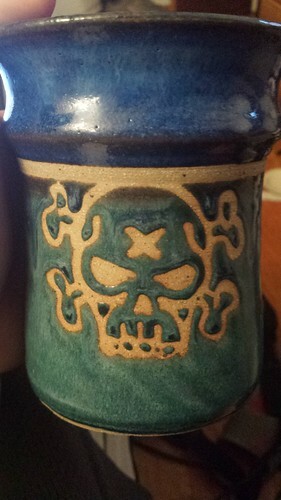 I definitely needed the right mug for all the ale I consumed over the weekend. One of the top things I was looking forward to aside from the marketplace was all the different types of foods they had there. Of course I wanted to get a big 'ol piece of mutton but decided against it. I ended up going with a turkey leg and some baked potato's along with some ale. I wasn't able to get a picture of ice fruit but it looked very delicious. Basically hollowed out giant lemon filled with icee. They had all sorts of different types of meats; brats, tri-tip, pulled pork, toad in a hole, steak sandwiches, sausages, and pork ribs. The market was filled with all sorts of leather, glass, and fine art. There was a lot of outfits they had not only for sale but you were also able to rent them for the event. The blades were a tad on the more expensive side but can't expect all that handmade craft to be cheap. We went for week 5 of the faire the the theme of the weekend was Fantasy. I was able to finish up my plague doctor mask around 1am the day of the faire haha. As soon as I charge my camera I'll be taking pictures of my mask and upload them along with the other batch of pictures.